More keynote speaker are being invited, and all the keynote speakers are sorted by the family name. In 1985 the US Federal Communications Commission (FCC) made several wireless spectrum bands available without a government license, known as “garbage band”, for Industrial, Medical, and Scientific (ISM) purposes, which unleashed a wave of innovations in the telecommunication industry that fundamentally changed humans experience and the interaction with wireless networks. This wave of innovations manifests itself in the introduction of affordable networking technologies capable of satisfying users’ needs in terms of mobility and connectivity. Among those technologies the Wi-Fi networking based on IEEE 802.11 Wireless LAN (WLAN) standards has distinguished itself as the technology of choice for the masses to satisfy their networking requirements at an affordable cost. Wi-Fi devices now are being deployed in diverse environments. These environments are characterized by the existence of many access points (AP) and mobile nodes in geographically limited areas. Increased interference from neighboring devices and severe collisions from channel contention in dense environments give rise to network performance degradation. Hence, recently, a new effort to seek fundamental improvement of IEEE 802.11, known as IEEE 802.11ax (a.k.a. 802.11 HEW), was approved to deliver a new generation of WLANs. This talk will firstly introduce the history and the state-of-the-art operation of WLANs protocol. The expected features and challenges for designing future WLANs protocol will also be discussed. Next, in this talk we will summarize the IEEE 802.11ax standardization activities in progress and introduce the key features proposed in the 802.11ax amendment. Finally, in this talk we will also address coexistence issues between the different communication technologies operating in the same band since LTE- advanced (4G) and 5G are also planning to make use of the unlicensed bands. Der-Jiunn Deng received the Ph.D. degree in electrical engineering from the Taiwan University in 2005. 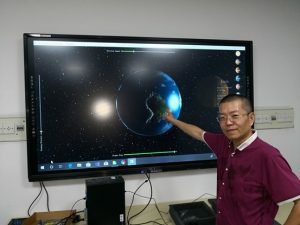 He joined the Changhua University of Education as an Assistant Professor in the Department of Computer Science and Information Engineering in August 2005 and then became a Distinguished Professor in August 2016. In July 2018, he was seconded to Overseas Chinese University as the vice president for research and development for a period of one year. 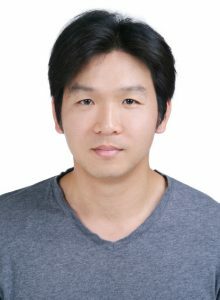 Dr. Deng has received a number of research awards, such as the Research Excellency Award of Changhua University of Education, the Outstanding Faculty Research Award of Changhua University of Education, the ICS 2014 Best Paper award, the NCS 2017 Best Paper Award, and the Chinacom 2017 Best Paper Award. 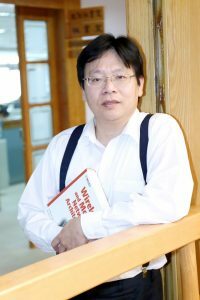 Dr. Deng is the Co-Editor-in-Chief of EAI Endorsed Transactions on IoT and Journal of Computers. He serves as an associate editor in IEEE Network Magazine and International Journal of Communication Systems. He also served or is serving on several program chairs, symposium chairs, and technical program committees for IEEE and other international conferences. His research interests include multimedia communication, quality-of-service, and wireless local network. Picture frame has been used to demonstrate artworks since ancient times. The importance of the frame was emphasized by a quote of American novelist Chuck Palahniuk: “It’s funny how the beauty of art has so much more to do with the frame than the artwork itself.” Although the concept of frame plays a significant role in art design, traditional picture frames do not allow interaction with human. To provide another dimension of artwork demonstration of picture frames, we utilize the Internet of Things (IoT) technology to create human and picture frame interaction. Specifically, an application-layer IoT device management platform called IoTtalk is used to quickly establish connections and meaningful interactions between IoT devices without concerning the lower-layer IoT protocols. Yi-Bing Lin received his Bachelor’s degree from Cheng Kung University, Taiwan, in 1983, and his Ph.D. from the University of Washington, USA, in 1990. From 1990 to 1995 he was a Research Scientist with Bellcore (Telcordia). He then joined the Chiao Tung University (NCTU) in Taiwan, where he remains. In 2010, Lin became a lifetime Chair Professor of NCTU, and in 2011, the Vice President of NCTU. During 2014 – 2016, Lin was Deputy Minister, Ministry of Science and Technology, Taiwan. Since 2016, Lin has been appointed as Vice Chancellor, University System of Taiwan (for NCTU, NTHU, NCU, and NYM). Lin is an Adjunct Research Fellow, Institute of Information Science, Academia Sinica, Research Center for Information Technology Innovation, Academia Sinica, and a member of board of directors, Chunghwa Telecom. He serves on the editorial boards of IEEE Trans. on Vehicular Technology. He is General or Program Chair for prestigious conferences including ACM MobiCom 2002. He is Guest Editor for several journals including IEEE Transactions on Computers. Lin is the author of the books Wireless and Mobile Network Architecture (Wiley, 2001), Wireless and Mobile All-IP Networks (John Wiley, 2005), and Charging for Mobile All-IP Telecommunications (Wiley, 2008). Lin received numerous research awards including 2005 NSC Distinguished Researcher, 2006 Academic Award of Ministry of Education and 2008 Award for Outstanding contributions in Science and Technology, Executive Yuen, 2011 Chair Award, and TWAS Prize in Engineering Sciences, 2011 (The Academy of Sciences for the Developing World). He is in the advisory boards or the review boards of various government organizations including Ministry of Economic Affairs, Ministry of Education, and Ministry of Transportation and Communications. Dr. Lin is Chair of IEEE Taipei Section. He is AAAS Fellow, ACM Fellow, IEEE Fellow, and IET Fellow. The demand on and assurance of ubiquitous access and information exchange in future wireless networks will yield massive data over wireless networks. The future mobile wireless networks will essentially evolve to be highly smart as well as autonomous. Consequently, the network needs to be able to find anomaly among vast networking behaviors, data, and signals, such that alarms can be reported to the network managers, which, however, is challenging due to the massive magnitude of data records as well as difficulty in using wireless signals flying over the air. This talk addresses big-data driven anomaly detection in mobile wireless networks with emphasis on two scenarios: 1) Activity-anomaly detection in cellular networks based on big call-record data; 2) Intrusion detection in massive machine-type communications driven by big air-interface data. Future research topics on big data applications and over mobile wireless networks will be also discussed. Pinyi Ren received the Ph.D. degree in Electronic and Communications System, the M.S. degree in Information and Communications Engineering, and the B.S. degree in Information and Control Engineering, in 2001, 1997, and 1994, respectively, all from Xi’an Jiaotong University, China. He joined the Information and Communications Department at Xi’an Jiaotong University in 2001 as an Assistant Professor. He has been promoted to an Associate Professor and a Professor in 2004 and 2009, respective. He has published over 100 technical papers on international Journals and conferences. He received the Best Letter Award of IEICE Communications Society 2010. He has over 30 issued Patent (First Inventor) and 3 authorized Software Copyright. Dr. Pinyi Ren serves as an Editor for the Journal of Xi’an Jiaotong University, the Leading Guest Editor for the Special Issue of Mobile Networks and Applications on “Distributed Wireless Networks and Services”, and the Leading Guest Editor for the Special Issues of Journal of Electronics on “Cognitive Radio”. He serves as the General Chair of ICST WICON 2011, the Co-Chair of IEEE VTC Spring 2016 Workshop on “Novel Medium Access and Resource Allocation for 5G Networks”, and frequently serves as the Technical Program Committee member of IEEE GLOBECOM, IEEE ICC, IEEE CCNC, etc. He is the frequent reviewers for top-rated international journals including IEEE Transactions on Wireless Communications, IEEE Transactions on Vehicular Technology, Wireless Communications & Mobile Computing, EURASIP Journal on Wireless Communications and Networking, etc. He is also the frequent reviewer for Chinese journals including China Science, Journal of Electronics, Journal of Communications, Journal of Electronics & Information Science, System Engineering and Electronics Technologies, Journal of Electronic Wave, Journal of Application Science, etc. Dr. Pinyi Ren is a Senior Member of Chinese Institute of Communications, a Member of IEICE and IEICE Communications Society, a Member of IEEE and IEEE Communications Society.